george : surfing in hawaii, 1900. Marian M. George : Surfriding in Hawaii, 1900. Little Journeys to Hawaii and the Phillipine Islands. A. Flanagan Company, Chicago, New York, 1900, pages 39 and 50. But the favorite amusement or pastime of the people was surf-riding in canoes or on surf boards. Men, women, and children all engaged in this pastime. 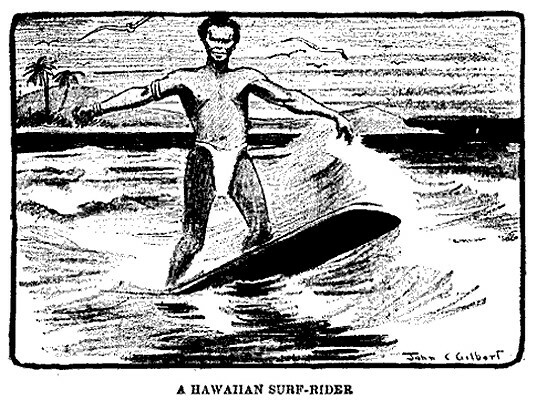 The Hawaiian called his surf plank a "wave-sliding board." It was made of bread-fruit wood. Sometimes he rode the surf lying face downward on his board; at other times he knelt; but the more expert rider stood up, balancing first on one foot and then on the other. The surf-riders would swim out to sea with these boards until they met a great wave. They then threw themselves upon the wave and were carried by it to the shore. The native is a famous fisherman. It would seem almost impossible to us for human beings to become expert enough at swimming and diving to be able to catch fish in the ocean without the use of hooks or nets; yet the Hawaiian can do this. He catches fish with his hands. Men, women and children may often be seen engaged in this work. Sometimes they crouch in shallow water and feel around the coral and lava bottom for fish, crabs and shrimps. Many species of fish in the Pacific Ocean hide themselves in clefts of the rocks and remain there when danger seems near. The fishers know their hiding places, and search them, even in deep water. So skillfill are they that even the swiftest fish have little chance of escape. The men and boys who catch the fish in deep water tie a bag around their waists and dive straight to the bottom. They hold fast to a rock with one hand to steady themselves, and with the other feel about in the crevices or under the overhanging rock ledges until they get hold of a fish. It is put into the bag and the search for others is continued until they are obliged to ascend for air. The sea furnishes not only food and employment, but the chief amusement - Surf-riding. If the native Hawaiian lives near the sea, hours of his time are spent in the water, or about the wharves. The rest of the day he spends in taro-planting, poi making, mat-weaving, reading, riding about, sleeping, playing his fiddle, or feasting. Geoff Cater (2010) : Marian M. George : Little Hawaii, 1900.